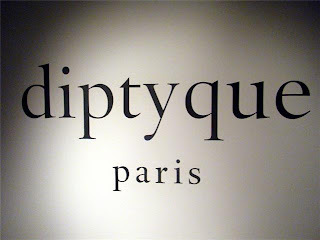 French luxe candle and fragrance company, Diptyque held a private sample sale event this evening from 6-8, for editors, buyers and VIP guests. Everyone was stocking up on favorite and discontinued scents at 40% to 90% off. I stocked up on some great gifts - candles, soap sets and hair and body wash, but you can also find eau de toilette, cologne and other bath & body products. Shopping was easy with testers to help you find just the right scents and a box to put your products in. Scott Goldman, President and Director of Sales for Cadre Noir Imports, was serving up my favorite liqueur, Combier, combined with champagne to create the 'French Perfume', the perfect-themed drink for this shopping event. It's always a pleasure to see Scott and his brother Curt, CEO of Cadre Noir Imports, as they always make each event they are involved with a friendly and enjoyable atmosphere. The public sale starts tomorrow and it's totally worth going to. Be sure to quickly find what you want and fight the crowd, as I'm sure it will be a busy sale. Get their early if you can!